This is just a curiosity thing on my part I’m hoping someone can help me with. We’ve noticed at every bar we’ve been to in Michigan that they all have real dart boards with metal tip darts and chalkboards to keep score. I’ve never seen that before. In Illinois, all the bars have those big machines where you put a couple bucks in and the machine keeps track of your score for you….and you use the bars’ plastic darts. So here are my questions…. Is there a reason that I never see those soft tipped dart machines in Michigan? Do you have to bring your own darts to the bar? Really, I like the metal darts better…it’s just not something I’ve seen before. I don’t know how else you would think this would end…. A Warren pizzeria owner received threatening phone calls Wednesday after a political pizza deal went awry. That’s not the best part of the story. “We put out a sign that said ‘McCain gave up on Michigan. Michigan should give up on McCain. Turn in your McCain lawn sign for one free, mini pizza with topping,’ ” she said. Approximately 300 signs were turned in by young and old customers, but the promotion ended Tuesday when police visited the business after receiving complaints that some of the submitted signs were stolen. Duh. If I could get a free pizza for turning in a McCain sign, I would probably wait until it got dark and jack a few too. Did the owner really think that die-hard Republicans would pull their signs up and give them to a pizzeria for a mini pizza? I love election season. You always get the best (wierdest?) news stories. If you remember from a few months ago, I mentioned how much J liked karaoke. 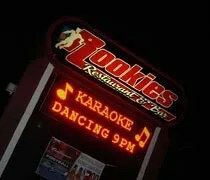 When she lived in Idaho Falls, she found a karaoke bar. When we lived in Peoria, we found a karaoke bar. When we moved to Lansing, we never found a karaoke bar. When we were in Chicago last weekend, she wanted to go find a bar, but we got watching Sarah Palin on Saturday Night Live and never made it out. That itch never went away, so she got on Google and again started looking for karaoke in Lansing. She found Rookies and after a phone call to see what time it started, she had her mind set on singing, so we pushed dinner back to 8:30 then went looking for Rookies.